INTRAsystems have operated in a number of sectors and worked on a range of high profile project from the ultra-modern offices of Bloomberg HQ in London to ground-breaking educational institutes such as the National Graphene Institute in Manchester to architecturally stunning shopping centres such as Victoria Gate in Leeds. 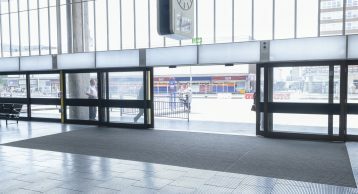 With an enhanced knowledge of the market place we can now add the largest bus station in western Europe – Preston Bus Station to our prolific list. Completed in 1969 by architects Keith Ingham and Charles Wilson from Building Design Partnership (now known as BDP) the 170-metre-long structure became the iconic symbol for the Brutalist Style. It boasted 40 gates for double decker buses, however in 2013, it faced demolition. With raising popularity amongst the architecture community as well as the local residents it soon gained heritage listing. 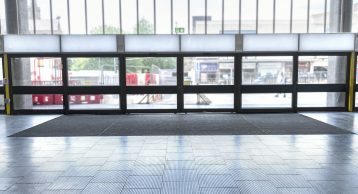 John Puttick Associates, an architect practice founded only a year before it won the RIBA-organised open competition to overhaul the station also won the restoration work to the Grade-II listed building. The station’s distinctive curved fins have turned into a beacon for the brutalist movement, along with the scale and grandeur of this project which is representative of an era when British architects were given the creative scope to produce grand works of public architecture. From the durable Iroko timber used in the benches, to the Pirelli rubber floor, the restoration gave another lifeline to this brilliant and architecturally stunning building. Understanding the importance of this restoration in keeping the character alive and maintaining the aesthetic of the interior was the first step in working with the architects. We strongly and passionately believe in making a great first impression. 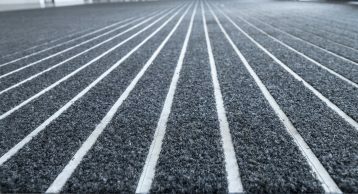 In doing so installing high quality Entrance Matting is the first barrier to foot borne dirt and moisture which can often leave the flooring beyond in a dirty, and un-safe state. 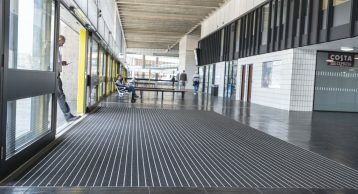 When the flooring in question is a restored Pirelli rubber design, having the correct Entrance Matting is even more imperative. 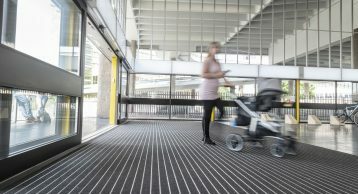 What better Entrance Matting to install in such an iconic location than our INTRAform Double Module, its extra wide fibre inserts offer increased dirt and moisture absorption, therefore preventing its ingress into the building leaving the flooring beyond in a clean, safe and aesthetically pleasing state. The brutalist design of the building means our exposed aluminium and INTRAlux Elite 608 Black Fibre insert work together to enhance the building. 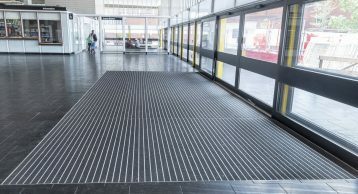 This Entrance Matting is not all form; helping to reduce cleaning costs for the management and keeping footfall safe it proves to be a functional product also. 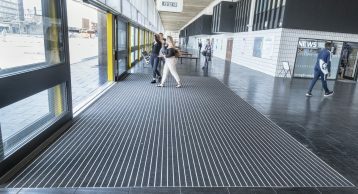 Our friendly and experienced team are always on hand to help with your next Entrance Matting requirements. Contact us today and let us help Enhance Your Buildings by Design. Email us on info@intramatting.com or simply call us on 01425 472000.